Ask fellow campers about "Village of Trees RV Resort" and nearby attractions. We've stayed here twice while in transit. It's a very nice commercial park, spacious with lots of trees, as the name implies. It's right on the Snake River. Sites are gravel, level, and room. Service is excellent. They guide you to your site and make sure everything is to your liking. In addition to all the usual campground services, there's a gas station and a grill, which will deliver to your site. It's nice for a break from cooking in the camper. We camped at Village of Trees RV Resort in a Truck Camper. Very nice park just off I-84! Great for an overnight stay, they have a store, gas, a deli (with delivery to your site) and a walking path! WiFi was good and the people are very friendly, they even lead you to the site. We will definitely stay here again! We camped at Village of Trees RV Resort in a Travel Trailer. Right off I-84 so you do hear some road noise if you are in back sites. Mostly gravel pull thru sites with nice grassy side yards. Sites are pretty close together but we had no issues. Some full timers and lots of weekenders but all were quiet and friendly. Restrooms were clean and while not the most fancy, they were easy to access and spotless. Host was friendly and helpful. They do deliver to your site from their grill / deli! While no dedicated or fenced dog park, Lots and lots of grassy areas for walking dogs! Very much appreciated the dog friendly nature of Village of Trees! Power and utilities were fine. We camped at Village of Trees RV Resort in a Motorhome. Park has FHU, pull through sites with cable TV and decent Wi-Fi. There is a pool, a playground, and bathroom facilities. We camped at Village of Trees RV Resort in a Motorhome. Trees, trees, and more trees ... and grass. An oasis in southern Idaho. Wonderful campground setting. 2 minutes off interstate. Sites long and level. Mostly drive throughs (except tent sites around perimeter). Good services. But, the WiFi was barely useable. The front office/store/restaurant will actually take your food order and deliver to your site (awesome after a long day on the road). Gravel site, grass, and trees in between sites, picnic table. Snake a River about 100 yards from western edge of the campground. Nice little park, boat ramp, and docks there. Fair bit of noise from interstate. We camped at Village of Trees RV Resort in a Motorhome. We stayed 1 night passing thru on the I-84. This was our third stay. Surprisingly, the rate is still the same as our last stay in 2016. This stay was the same pleasant experience as before. The park is a very short drive from the interstate (Exit 216: HWY 77) along a 2 lane rural paved road. The sites while some may look like back-in are P/T's. There are a few sites that appear to be extended stay sites. The interior roads and sites are compacted gravel. The interior roads and turns are very narrow and tight but we remained connected to the toad. The P/T sites could be considered short but we didn't have to disconnect the toad. There was some trees encroachment on some of the sites & portion of the road. Sufficient room to open slides. This park understands the simple concept of the importance of a flat, level site as the sites were level and flat. Distance and grassy areas establish privacy between the sites. They have full hook ups - water, electricity (50/30 AMP), & multiple sewer connections. The sewer connection was at the ground so it was easy to establish a downhill flow. There was an outside table. No fire pit. There are trees scattered around the park so satellite reception would be dependent upon site assignment and your dish configuration. The park brochure showed 23 cable channels but made no mention of broadcast channels. Didn't try to get any broadcast channels. The park provided WiFi was good. It was password protected. Didn't try our Verizon WiFi hotspot or the NET10 phone so don't know about reception. No designated fenced pet areas. There were bag dispensers and collection stations for waste around the park. There was sufficient area to walk dogs along the park's roads and grassy areas on the park's perimeter. There was also a grass surface Nature Walk Path along the Snake River. The park was quiet but there weren't a lot of campers. The on-site restaurant offered delivery which was a nice amenity. We camped at Village of Trees RV Resort in a Motorhome. Not really a bad site. Rows A to C had a thicker tree canopy. Rows D - F had fewer trees for better opportunity for satellite reception. Took advantage of the on-site restaurant for breakfast. Good portions and reasonable cost. Not much ambiance. Very nice well maintained park. Well graded gravel roads and parking. Wide, well maintained grassy areas between sites. Plenty of mature shade trees. Room for pets and big play area for the kids. Right next to the Snake River. Easy freeway access and we didn't notice any traffic noise. We'll be back. We camped at Village of Trees RV Resort in a Travel Trailer. First thing was the place is over priced, and the sites were tight, watch out for trees and your slides. This place was OK, didn't give us any warm and fuzzy feeling. Next time we'll try another exit. Not sure how they got the rating here, which is the only reason we gave it a try! 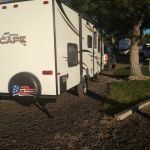 We camped at Village of Trees RV Resort in a Fifth Wheel. Always stop here when we are traveling from Colorado to Pacific Coast. Always good service and clean park. Quiet and friendly. The food at the main building small food vendor is great. Worth the money. We will stay here again if going through. 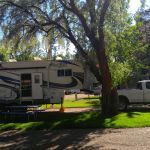 We camped at Village of Trees RV Resort in a Fifth Wheel. Great overnight spot close to interstate but not "real" noisy. If satellite is needed be sure to ask. Very few sites without trees. Then again, if you want shade you can have it. Nice park and they will deliver dinner. Spacious lots. Site surface is grass and features a picnic table. We camped at Village of Trees RV Resort in a Motorhome. Order a Reuben and have it delivered. Park is older but it is well kept and has everything you need. You can even order food and they will deliver to your RV. The squirrels are so friendly that they will take food right from your hand and would have come in our RV had we let them. 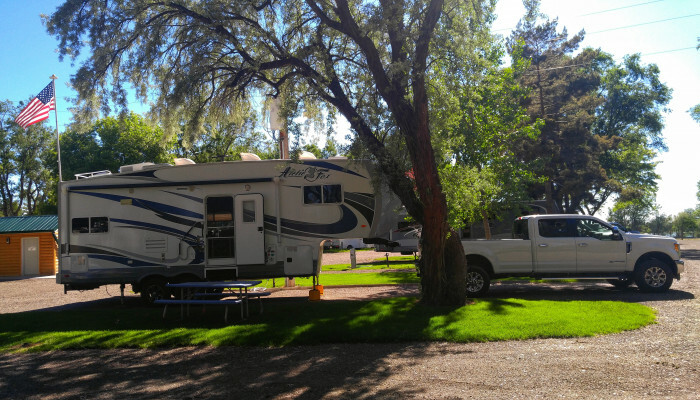 We camped at Village of Trees RV Resort in a Fifth Wheel. Only spent the night so can't make any recommendations on things to do in the area. This a wonderful stay right off of the freeway, however (to us) it was not bothersome! Very wide and long pull throughs! Lots of older trees which is very pleasant and do not hinder getting in or out of your site. You may order from their "grill" and have it delivered to your site! Stayed here before and will again! Plenty of room for our 57' total length! All sites are pull through. We camped at Village of Trees RV Resort in a Fifth Wheel. Short walk to the Snake River from your site! This rv park is one of the best I've stayed at ! It is right off 84 east in Idaho. Ex 216 . The park has everything you need showers and baths , pool and water activities. They will even deliver your food order to your rig.the people running it are so helpful and happy . If you're in Idaho and need an rv park make your stop here! We camped at Village of Trees RV Resort in a Motorhome. Stayed one night to get off the road and out of the wind. Worked for that purpose. Office staff was a bit abrupt. Their 'grill' as described by others was marginal. Not my kind of place and will not stay again. We camped at Village of Trees RV Resort in a Travel Trailer. Beware coming east on I-84, do not take exit 216 as that exit is closed. You have to exit at 211, then follow signs for the detour. Park registration is in store, which is stocked along with a grill. They will also deliver to your site. After squaring up bill, you are led to your site. Good long pull thru with OK distance between neighbors. Park is right on the snake River and there is a dock and ramp there. Good cell reception, wifi very weak. Lots of seasonals but never a security issue. I would stay here again. We camped at Village of Trees RV Resort in a Motorhome. Shopping in local town good. Other commentators mentioned the onsite restaurant was good. Well we wouldn't eat there as it was on the dirty side. If south bound on I-84 you will have to take exit 211 as 216 is closed due to Snake River Bridge repairs. Follow the detour signs and you will wind up right in front of the Park. Hoping the bridge work will be complete on our next time through. Order from the Grill in the office. Delicious. They deliver free to your site. Visit the tiny town of Rupert--historical and there is a really good Mexican cafe there. Row E for automatic satellite. See the City of Rocks. Quite remarkable. City of Rocks national monument and Castle Rock state park 40 miles south. City of Rocks, Albion, Cleveland Lake, Snake River, Rupert Quilt Store! Not really a bad site. Rows A to C had a thicker tree canopy. Rows D - F had fewer trees for better opportunity for satellite reception. If you stay here head to Rupert and have dinner at Henry's at the drift Inn. Good dinner excellent patio and people. Close to City of Rocks and is convenient stopping point on way to Salt Lake City or Boise. Food delivery to campsite--so convenient! The City of Trees is a great place to visit, historic (California Trail), and a geological spectacle. The grill int he service station has a wide ranging menu with low, low prices and delivery to your site if you wish. Stayed a week and this location is central to Twin Falls area for Shoshone Falls to the west, American Falls to the east and City of Rocks to the south, which is a must see for the scenery and to watch the climbers. Try the on-site Village Grill. The store and restaurant stay open until 9 pm - and they will deliver food to your camp site :) The showers were free and were the best we found on our cross-country trip. Don't miss City of Rocks NR. Was a real treat! Are you affiliated with Village of Trees RV Resort ?